January 17th, 2007 is special. I got to live this day twice! In Tokyo, I woke up late at 9AM and went down to the Cascade Cafe for breakfast. I had a couple of hours to kill, so I took some photos of people on the steets (I had heard so much about the street fashion in Tokyo which is true; everyone here seems well-dressed), updated my blog and then checked out of hotel to take the limousine bus ride to Narita Airport. Narita Airport is one of the most efficient in the world. They had a large number of counters specifically catering to Business Class travellers which meant that checking in was a breeze. Narita also has a good collection of duty-free shops: upscale designer stuff, local handicrafts, electronics, food, etc. I was travelling United Airlines after a very long time; they have a decent lounge in Narita and I could see at least a dozen gates occupied by United flights. Somewhere over the Pacific, our flight crossed the International Date Time, which means Jan 17th began all over again for me! And so at 9 AM on the same day, I took a taxi from San Francisco Airport and checked into the very nice-looking Sofitel Hotel in Redwood City. Actually Tokyo street fashion is something which is listed as a thing to see in most travel mags. However, the people mostly wear contemporary (western) clothes here; kimonos are visible only during traditional days ceremonial days. 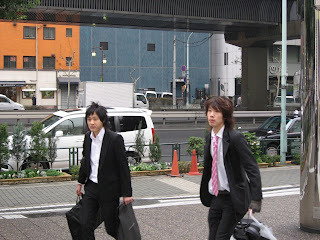 Also, Japanese men and women are very formal in their clothes during every business meeting or in office; almost everyone I met/saw was in dark suits.